Maple Kitchen Islands, More Counter Tops, Lyptus & Cherry Butcher Block, Walnut and Oak Counter Tops...On Sale! Solid Maple Butcherblock Countertops can enhance your kitchen! These tops combine function and style, solid maple counter tops, table tops are very nice looking. Demand the best for your kitchen, our NSF certified butcherblocks are Made in USA. Many Sizes are In Stock! We have fast delivery. Butcher block countertops are a perfect flow of beauty and function. Made in USA from Hard Rock Maple, these natural solid tops impart a warm friendly glow to any kitchen. Our Chefs prefer wood counters, butcher blocks & cutting boards for slicing, dicing, and chopping. Professional Bakers choose these for prep and kneading dough. No other countertop surface offers advantages of maple butcher block and these are an economical choice. Butcher block countertops add natural warm beauty to compliment any decor. Northern rock maple is one of the hardest & most durable woods. 120 years experience building quality butcher block assures you of a kitchen countertop that last a lifetime. 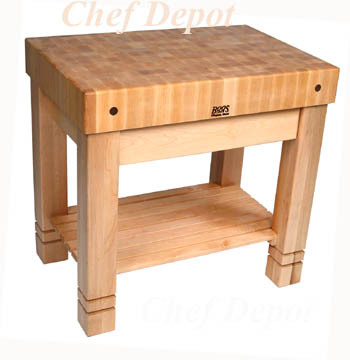 Maple Kitchen Tables , Prep Carts , Butcher Blocks and Swivel Stools are on sale. These are made to order for you. Call us with questions. More Maple Counters are here! Our select #1 grade Solid Rock Maple Edge Grain Kitchen Counter Tops feature full rails. You will love this counter top in your kitchen! Choose from natural oil/beeswax finish or Varnique below. Several other finishes are also available. The countertops listed below are 1.5 inches thick. The 48 in. wide tops are 1.75 inches thick. Optional backsplashes are 4 in. tall. Custom sizes and other thicknesses, please call us. All made in USA, with 1 year mfr. warranty. Free Shipping to most parts of USA! Large quantity discounts, call us! Call to order (630) 739-5200 Email us here here for custom sizes and prices! USA Sale - Call Us or Email Us! QUANTITY DISCOUNTS ~ Sale - Call Us or Email Us! Our Maple Back-splashes are made from select America edge grain Maple, available in many sizes. These Backsplashes are 3/4 in. thick and 4 in. tall. Choose a clear durable food safe varnish or mineral oil finish. You must buy a countertop to ship with a backsplash. Ordering several? - Call Us or Email Us and save! Monthly Special Sale - Call Us, phone: 630 739 5200 or Email Us for the Lowest Price! Click Here for more Walnut Cutting Boards & Chop Blocks! 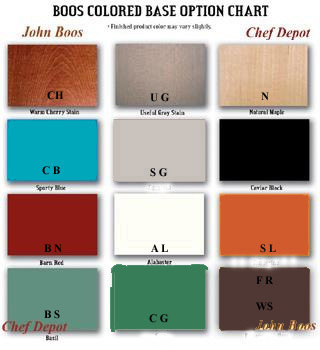 John Boos Solid Maple Top Tables are the best made. This Solid Hard Rock Maple top is 1 1/2 in. Thick with a natural oil finish. 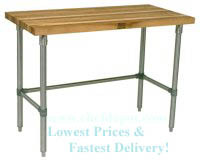 This table has galvanized steel legs and support rails that are adjustable up and down. It is available in many sizes, several as listed below. These tables are shipped knocked down for fast & easy assembly. This table is perfect for storing a wine rack, food bowls, coffe makers, ect.. or add swivel stools underneath. It is also nice for a garbage can underneath it when you are doing a lot of prep work. This table is 35 in. tall. NSF Certified for safety. Option #2 changes the galvanized steel leg configuration to allow 4 stools to fit underneath! One of our Bakery kitchens is using a very large BOOS prep table for daily production of baked goods (click here to see it). These Commercial Tables have random maple pieces with slight color varations throughout. For Ultra Premium Butcher Block Tops with full length laminated maple pieces there is a 25% upcharge, click the button below or call us to request this option! Add optional caster wheels below. The butcher block top requires rubbing with mystery oil, every few months to keep it looking new! These tables are handmade to order, we can ship yours in aprox. 15 days! Most sizes. Free Shipping is available in most areas of the continental USA only. Please call us for other sizes and options. Sale Price $399.00 with Free Shipping Not Tax & Great Customer Service! Sale Price $485.00 Free Shipping & Great Customer Service! Sale Price $676.00 Free Shipping & Great Customer Service! Sale Price $689.00 Free Shipping & Great Customer Service! Sale Price $864.00 with Free Shipping & Great Customer Service! Sale Price $909.00 with Free Shipping & Great Customer Service! Sale Price $1059.00 Free Shipping & Great Customer Service! Sale Price $1019.00 Free Shipping & Great Customer Service! Sale Price $519.00 with Free Shipping & Great Customer Service! Sale Price $635.00 with Free Shipping & Great Customer Service! Sale Price $705.00 with Free Shipping & Great Customer Service! Sale Price $810.00 with Free Shipping & Great Customer Service! Sale Price $999.00 with Free Shipping & Great Customer Service! Sale Price $1049.00 with Free Shipping & Great Customer Service! Sale Price $1249.00 with Free Shipping & Great Customer Service! Sale Price $1629.00 with Free Shipping & Great Customer Service! Sale Price $549.00 with Free Shipping & Great Customer Service! Sale Price $659.00 with Free Shipping & Great Customer Service! Sale Price $749.00 with Free Shipping & Great Customer Service! Sale Price $829.00 with Free Shipping & Great Customer Service! Sale Price $1139.00 with Free Shipping & Great Customer Service! Sale Price $1153.00 with Free Shipping & Great Customer Service! Sale Price 1459.00 with Free Shipping & Great Customer Service! Many other sizes of this table are available, please call us for the sale price. Video shows you How easy it is to maintain your butcher blocks. Click Here for Professional Chef Knives! Some of the items used in the kitchen are New Razor Sharp Chef Knives! A sharp knife is required by every Chef and Gourmet cook. Chef is using some of his favorite Maple and Walnut Cutting Boards! This is the new Homestead Block by John Boos, it measures 36" x 24" x 5" and stands 34" overall. The top is edge grain butcher block maple. This table has a FDA approved food safe natural finish. The butcher block top requires rubbing with Mystery Oil or Wood Cream, every few months to keep it looking new. It features a large storage drawer and will last for generations! Please click the button below to order, then email us your color selection. We can ship your new Block in aprox. 10 days! Call us for sale prices. USA Sale - Call us or email us ! Call to order or email questions! Click the links and the right green arrow for more Maple Carts & Tables!